Official emblem of North Korea's newly-named space agency, the National Aerospace Development Administration. If outer space is indeed a lot of nothing, than the newly named North Korean space agency may be aptly titled, albeit inadvertently. The nation — formally, the Democratic People's Republic of Korea (DPRK) — on Tuesday (April 1) marked the first anniversary of its space agency's founding by announcing the name and emblem for the organization: the National Aerospace Development Administration, or NADA. Not that North Korea had nothing in mind when choosing the name. "The National Aerospace Development Administration is the country's central guidance institution organizing all the space development projects," the state news service, the Korean Central News Agency, explained in a release. "Its mission is to put into practice the idea and principle of the DPRK government to develop the space [sic] for peaceful purpose." The NADA logo is described as representing the agency's "character, mission, position, and development prospect." 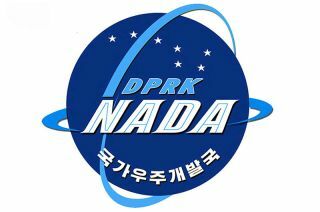 Featuring a blue globe with lighter blue intercrossing rings symbolizing orbiting satellites, the emblem is emblazoned with "DPRK NADA" and, in Korean, "Kukgaujugaebalkuk," or "National Aerospace Development Administration." Above the words are seven stars forming the "Big Dipper" (Ursa Major, or Big Bear) constellation. "The Great Bear reflects the will of the space scientists of the DPRK to glorify Kim Il Sung's and Kim Jong Il's Korea as a space power," KCNA reported. "The globe represents the DPRK's idea for peaceful development of the space and the rings show the DPRK's will to launch satellite into all orbits." Some media, including the Guardian in the UK, suggested that the new logo shared a resemblance to another space agency's insignia: NASA's. "The state news agency neglects to mention one glaring thing," the Guardian wrote, "the new logo looks a lot like that of NASA, the space agency of Pyongyang foe's, the U.S., right down to the blue globe, lettering and swooshed ring." North Korea launched its first satellite to successfully orbit the Earth in December 2012. The washing-machine-sized probe reportedly failed soon after it entered space, but the feat, which came on the country's fifth try, still established the DPRK as the tenth nation capable of putting a satellite into orbit using its own rocket. The launch however, was criticized by the United States and international community, including the United Nations, which regarded the flight as a violation of the ban against North Korean ballistic missile tests. For its part, North Korea's announcement of NADA stated the agency was established to develop space for peaceful purposes and the law that founded it called for cooperating with other countries on space projects. At the same time, the law also rejected the "application of selectivity and double-standards in space activities" and in the "weaponization of outer space."